Hit of the Week 1046 was recorded sometime in March of 1930, the exact date is unknown, in New York City. It went to the newsstands on May 15, 1930. The all-star Ellington lineup includes Duke on piano and directing, Arthur Whetsel, Cootie Williams, and Freddie Jenkins on trumpets, Joe “Tricky Sam” Nanton, and Juan Tizol on trombones, Barney Bigard on clarinet and tenor sax, Johnny Hodges on clarinet, soprano sax, and alto sax, Harry Carney on clarinet, alto sax, and baritone sax, Fred Guy on banjo, Wellman Braud on string bass, and Sonny Greer on the drums. Ellington’s manager, the music mogul Irving Mills sings the vocal. This session also produced a recording of “Sing You Sinners”, and was Ellington’s sole session for Hit of the Week. Here Ellington and the boys play a fine rendition of “St. James Infirmary”, this record’s only side. 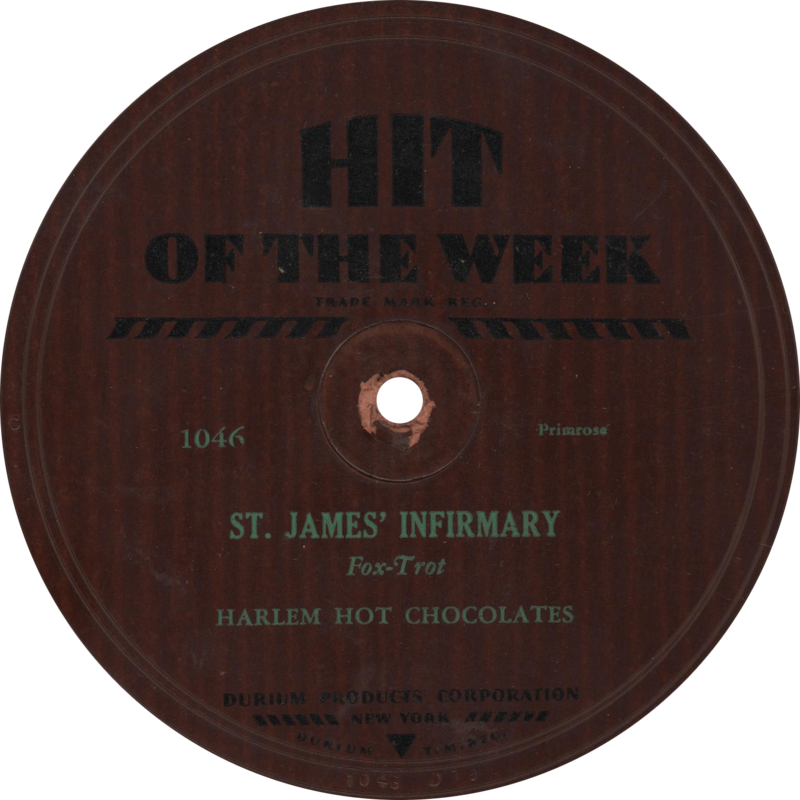 St. James Infirmary, recorded March 1930 by the Harlem Hot Chocolates. Updated with improved audio on March 31, 2018. This entry was posted in Records and tagged 1930, 1930s, Arthur Whetsel, Barney Bigard, Cootie Williams, Duke Ellington, Durium, Fred Guy, Freddie Jenkins, Harlem, Harry Carney, Hit of the Week, Irving Mills, Jazz, Johnny Hodges, Juan Tizol, New York, Sonny Greer, Tricky Sam Nanton, Wellman Braud by R. Connor Montgomery. Bookmark the permalink.